I am an Excedrin® Extra Strength Brand Ambassador and I have been compensated for my time, however, all opinions and experiences are my very own. It's that time of year again . . .black cats and witch's hats are in our rear view mirror and ahead of us is a sea of turkeys, wrapping paper, candles, elves and more. That's right, it's the Holiday Season, and while that brings much joy to many people, it can also bring on headaches or migraines. Traveling this holiday season? Be sure to carry Excedrin® Extra Strength with you when you're on the go for fast relief should a headache or migraine strike. This is something I often forget to do, and then have to run to Walgreens or Target to pick some up. A Chance to Win - Just for my scraps Readers! How would you like an extra $100 right about now? 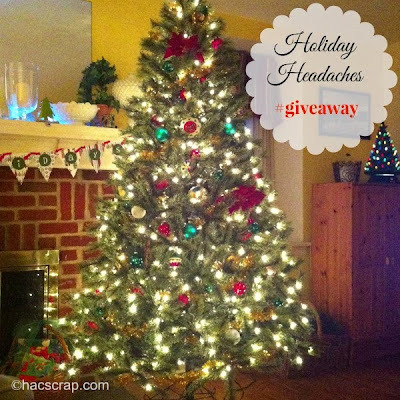 Well one lucky reader that leaves a comment below telling me what your biggest holiday headache is, has the chance to win a $100 American Express Gift Card from Excedrin®. Who couldn't use an extra $100 this time of the year right? fine print - Giveaway open to Continental US Residents only. Be sure to include a valid email address so I can contact you. Comments close on December 13thh at midnight Eastern Daylight Time. Winner will be selected using random.org from all valid entries. Winner must reply within 48 hours of notification or another winner will be selected using the same methods. disclosure - I am an Excedrin® Extra Strength Brand Ambassador and I have been compensated for my time. Excedrin is providing the prize to the winner. As always, all opinions and experiences are my very own. Cooking and cleaning for everyone is a big headache during the holidays. Everyone seems to be relaxing but I'm running all over the place. Store crowds and traffic cause headache to me. My biggest headache is managing schedules right now! My biggest headache is wrapping. There is never enough time! My holiday headache is finding the perfect gift for my mom. She and I have very similar tastes, but she has everything...and a gift card seems so impersonal. My biggest holiday headache is not only buying all the gifts, but then I have to wrap them all! It's fun, but I always end up staying up too late on Christmas eve. I'm in the cat headache boat, too - I can't leave my presents under the tree or the cats will play and scratch at them, and the rabbit will EAT them! my biggest holiday headache is all the last minute shopping I do! It's the clean-up. I tell ya' I would do so much more if I wasn't left with so many dishes and so much chaos. My biggest holiday headache is trying to get guest rooms ready and food bought and prepared for out of town guests. Usually my biggest holiday headache is the arrival of family, but once they are there and we start talking about old times, I am glad they are there. When they leave and we have to clean up is when the real headache begins. I think my biggest holiday headache is telling my daughter she can't have every toy she sees advertised on TV. My biggest headache is narrowing down my list of goodies I want to make. My biggest is preparing dinner for 30 people who come over every year;.